A striking plant, quite handsome, with a hairy, pale, leafy stem, from six inches to two feet tall, and gray-green, rather velvety leaves, generally toothless. 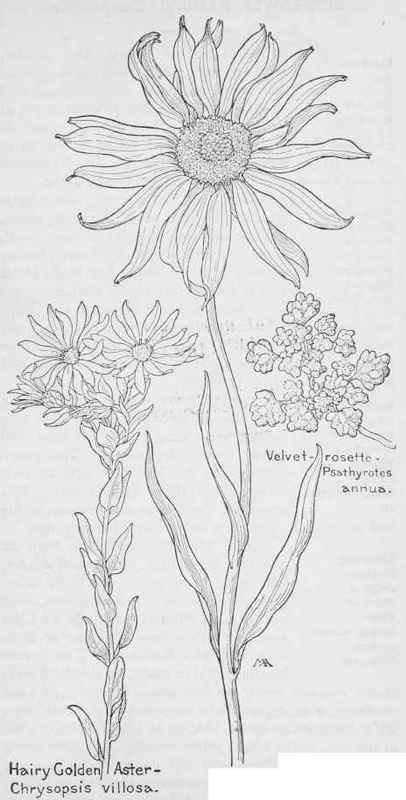 The flowers are an inch or more across, with bright golden-yellow rays and centers of the same shade, growing singly, or in a more or less crowded cluster at the top of the stalk. This is common in open ground and dry hills, up to an altitude of ten thousand feet, as far east as Alabama, and there are many varieties. The Greek name means "golden aspect. "